Tim Berners-Lee has been advocating some sort of internet rating system to determine quality of online information - that the web today needs to provide people with a way to determine which information is reliable and which is not. "On the web the thinking of cults can spread very rapidly and suddenly a cult which was twelve people who had some deep personal issues suddenly find a formula which is very believable. A sort of conspiracy theory of sorts and which you can imagine spreading to thousands of people and being deeply damaging," he warns. The reported Death of Lil Wayne fits into this thinking - rumour becomes hard facts through viral internet spread. 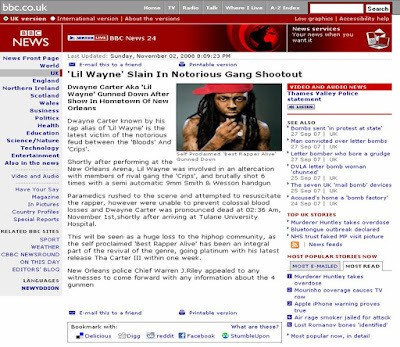 The 'Lil Wayne is dead' story started after a page was mocked up to look like an official BBC News page and reported that Lil Wayne has been killed in a drive by shooting. So was Lil Wayne 'brutally shot 6 times'? 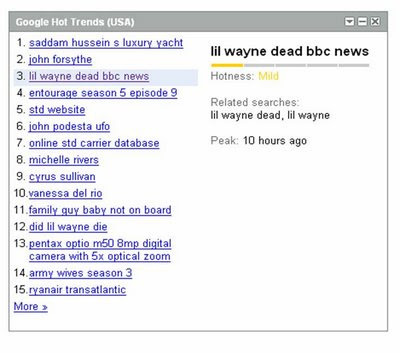 The consensus (from Perez Hilton through to online news sites) is that Lil Wayne was not killed this weekend, but how long before we can really know for sure? Now imagine this is your brand. We have seen the effects of inaccurate online stories on company value recently (United Airlines bankrupt, Steve Jobs heart attack etc). All it takes is for one person to create a false rumour and if not tracked properly / dealt with efficiently it can have significant effects on company value, standing and natural search listings. So Lil Wayne has 'survived' - would you brand if it was detrimentally misreported? How long would it be before you knew what was happening? How long before you would be in a position to deal with it? Tim Berners-Lee's ideas may eventually be adopted, but in the mean time brands need to arm themselves to prevent their own Lil Wayne moments.